What would you like to create? A digital artwork? A plugin to a VJ app? A UI prototype? Whatever it is, the thing you create in Vuo is called a composition. Open Vuo and pick out building blocks. Connect them so they work together. You're well on your way to creating your own unique compositions with Vuo! When creating a composition, you start simple — with small, simple building blocks called nodes. Each node has a specific job that it does. The job is easy to find out — it's written across the top of the node, like "Play Movie" or "Adjust Image Colors". When you connect nodes together with lines called cables, the nodes can work together. From these simple nodes and cables, you can create intricate, captivating effects. The idea of Vuo is that you can mix and mash up all kinds of nodes to create a composition. You can combine mouse, keyboard, and 2D graphics. Or Leap Motion, video, and audio. Or Arduino with 3D models and stereoscopic rendering. There are so many possibilities. Browsing through Vuo's many nodes might even spark your creativity. It's easy to find the nodes you want — you can search by name or keyword. Each node is well documented, and many nodes come with example compositions to show you how to use them. Vuo comes with a ton of built-in nodes. You can add even more by downloading nodes created by the Vuo community. If you've ever done text programming, you know that creating and viewing are usually separate steps. In Vuo, it's different — you can see your composition in action while you're creating it. You don't have to stop and restart the composition to see your changes. While your composition is running, you can reveal its inner workings to help you troubleshoot or just see what's going on. Clicking on any node's input or output pops up a real-time view of the information flowing through your composition. You don't have to learn Vuo all on your own. There's a user manual and video tutorials to help you get started. 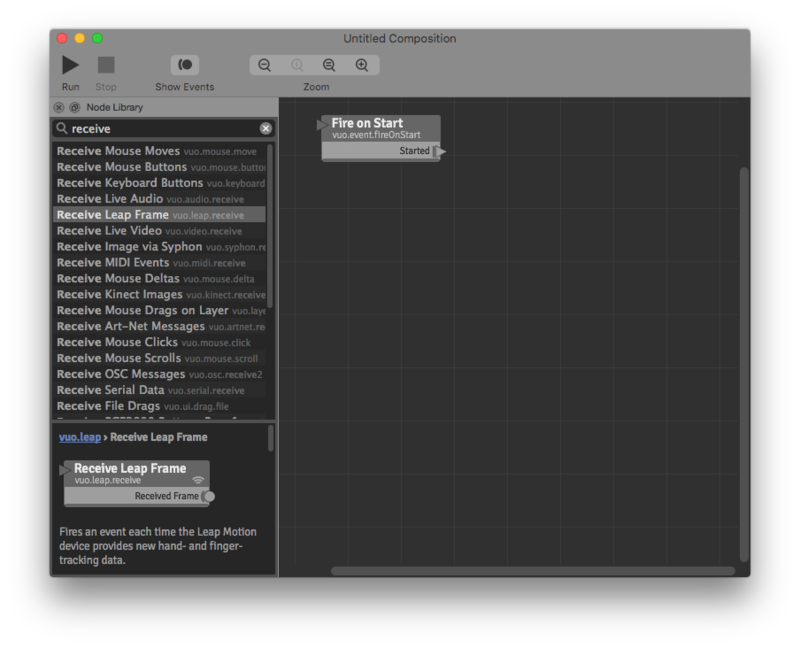 Vuo comes with dozens of example compositions. Plus, you can get help and inspiration from the community of people around the world who use Vuo.